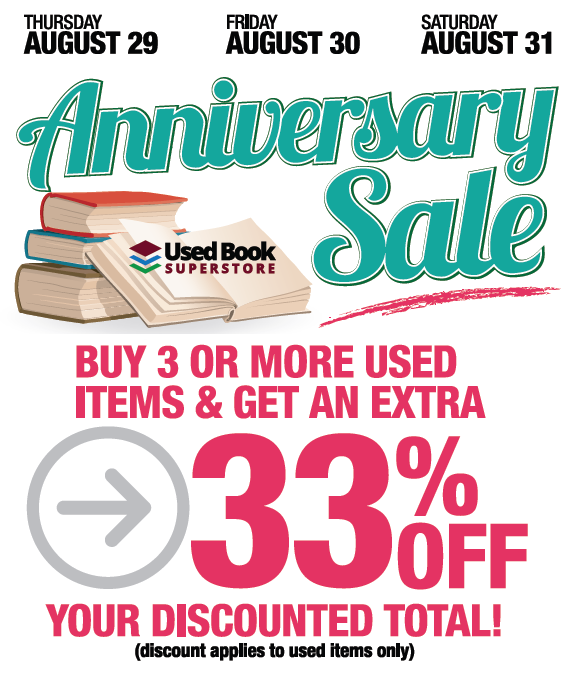 The Used Book Superstores will be closing at 5:00 today (Tuesday) due to the bad weather. We apologize for any inconvenience. Stay safe. There is no truer insight into a civilization than a four way intersection with non-functioning traffic lights. Sadly, yesterday we closed our Wilmington location. The rest of our stores are doing great, though, and we hope you'll come by soon. Today's $5 off for every $25 spent on anything in the store! Black Friday, Black Schm-iday! BIG changes at our Burlington store! 15 bays of vintage books have been added and the kids section has grown by over 25%! March 29th & 30th- Buy one used book at our regular low price and get the rest of your used books 60% off the sticker price!